Three seniors were recently honored by the Maine Township High School District 207 Board of Education as “207’s Best.” For December honors, Phoebe K., of Maine West; Emma L., of Maine South; and Josh P., of Maine East, were recognized for their work in Fine and Performing Arts. At Maine West, Phoebe seems to do it all in the fine arts arena. In addition to acting the lead role in Little Shop of Horrors, Cinderella and Peter and the Starcatcher, she has served as a student producer and director for other productions. She is WMTH-TV station manager, serves as a Drama Club officer and was selected by, and performed in, the competitive District #7 ILMEA Chorus. She pursues Fine Arts studies in the classroom and this year is enrolled in Chamber Choir, Digital Audio and Music Production, Drama 2, Photo 3 and Advanced TV. West Fine Arts Chair Pat Barnett said that Phoebe could “easily pursue a career in any of these disciplines,” referring to music, theatre or art. A member of the National Honor Society, Phoebe has earned a 4.02 grade point average. Phoebe told Board of Education members that she plans to study music theatre education at either New York University, Syracuse University or the American Musical and Dramatic Academy Conservatory. Maine South Principal Dr. Ben Collins wrote in his introductory letter that “If there is someone who crosses all the areas of the Fine Arts and is truly deserving of being deemed 207’s Best for Fine Arts, it is Emma.” Highly accomplished in visual arts, music and theatre, Emma has created a website to display her mixed-media visual art and has been a valuable resource for other students developing their own portfolio websites. She is the drumline captain, served as V-Show act captain, and composed and arranged music for V-Show. She is a member of the Tri-M Honors Music Society, Thespian Society, pit orchestra, marching band, wind ensemble and symphony orchestra. In addition, Emma is an athlete, excelling on South’s swim team. In addition, Emma has accomplished all of this while taking a rigorous course load that has included six Advanced Placement and numerous accelerated courses. Emma told Board members she would like to study music education. At Maine East, Josh excels in visual arts and music. A four-year band member and four-year art student, he has performed in V-Show and played in the pit orchestras for musicals. He will make his stage debut in this year’s East musical: Newsies. He has performed in the Maine East Jazz Band and is a member of the school’s A Cappella vocal jazz ensemble. In his senior year, teachers agree, Josh is fully hitting his fine arts stride. 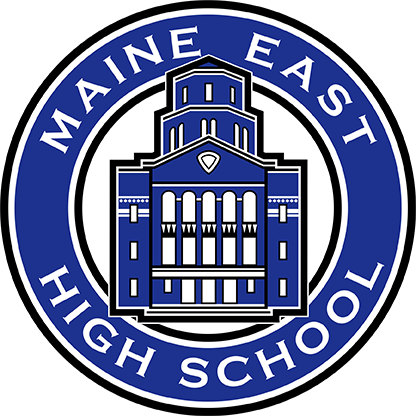 Maine East Principal Dr. Mike Pressler quoted Director of Bands Pam Holt as noting that “Josh has soared this fall, improving more in the past three months than many students do in as many years.” Director of Choirs Kate Lee stated that Josh is “the theater kid who came out of nowhere” to emerge this year as a talented bass and beatboxer in A Cappella. As for visual art, AP Art Teacher Magdalene Eisenberg said that Josh is working on “a truly amazing and unique portfolio.” Josh told the Board that he will attend community college in preparation a fine arts college.